" Melting pot iftaars, Quran competitions & Eid celebrations in amusement parks" - were the highlights of the talk today on how Ramadhan was observed in the USA by two Al Qamar moms who had lived there. Um Omar & Um Abdullah spoke about the how different communities of Muslims from all over the world celebrate Ramadhan together. 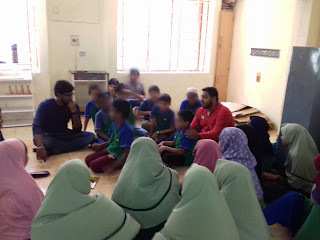 The children were fascinated by the idea that the local fire department's permission has to be taken for those observing itikaf, how the Imam gave a 20 question quiz after Taraweeh, how the women competed to memorize long Surahs in one week! The talk is a part of a series on "Ramadhan around the world" which aims to give children a sense of a global ummah! Jazak Allah Um Omar & Um Abdullah for taking the time out during this busy month to come talk to the children!!! !